The mother can no longer hide the joey and a lump is visible by looking at mom. 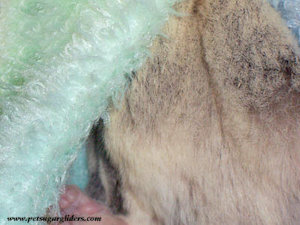 If there are twins in pouch, you will see a lump on each side of her pouch. Should there be only one baby, the pouch will usually appear lopsided. If you do not see a lump by now, it is possible that the mother has rejected or cannibalized the joey. If the mother is on the larger side, it is possible for her to tuck the joey(s) in the back of her pouch, but it will affect her gait as she moves around the cage. Breeding can sometimes be a heartbreaking experience. These joeys were pulled and rejected by the mother. They were about 3-4 weeks in pouch. 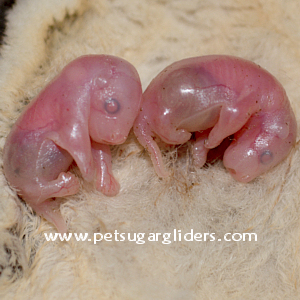 These two lumps are joeys about 3-4 weeks in pouch.